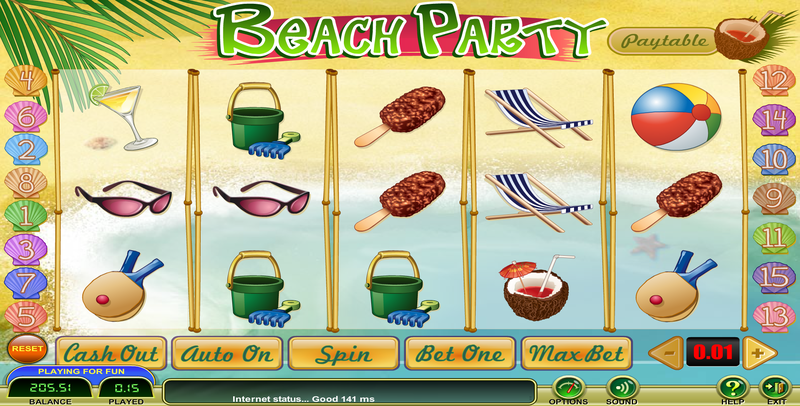 Amigotechs is a supplier of Internet casino software out of Panama. Their games are simple and easy to play. I suspect their business model is primarily as a casino add-on to sports books. The game rules are often stingy. The games take a long time to load. The help files often omit important information about the rules. Ridiculous inconsistencies in the rules. 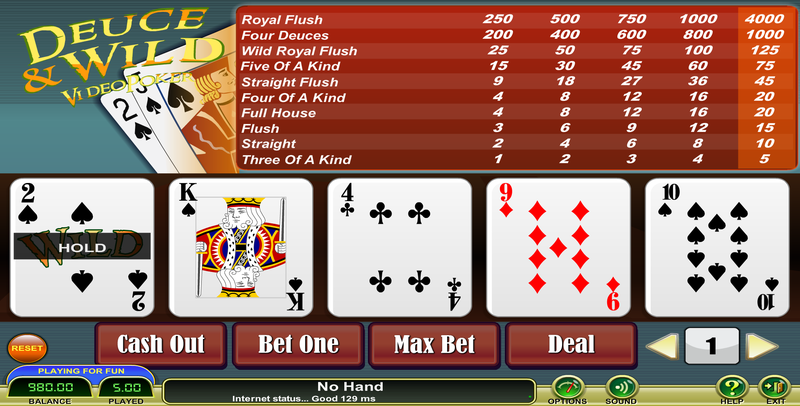 For example, the video poker house edge ranges from 0.20% to 13.19%. 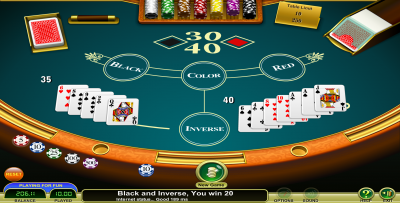 They dare to offer 6-5 blackjack — which is an abomination to the game. More importantly, Amigotechs has twice been caught dealing an unfair game of video poker. The two incidents were three years apart. For more information on that story, please see my Internet casino blacklist. 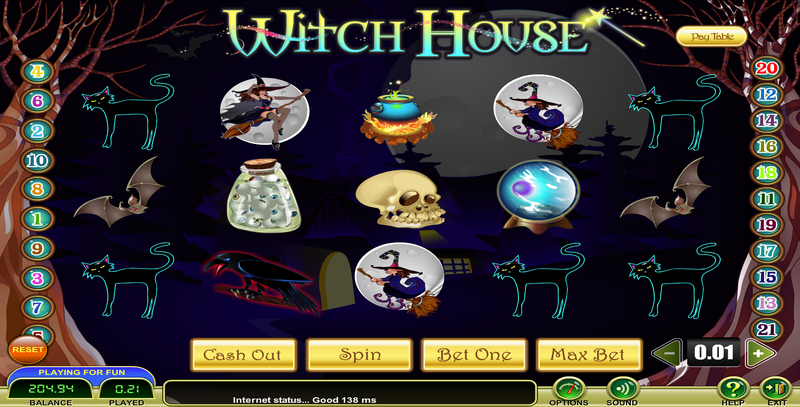 This game is based on the roll of three special dice. Two are numbered with only a 1, 2, and X. The other serves as a multiplier. 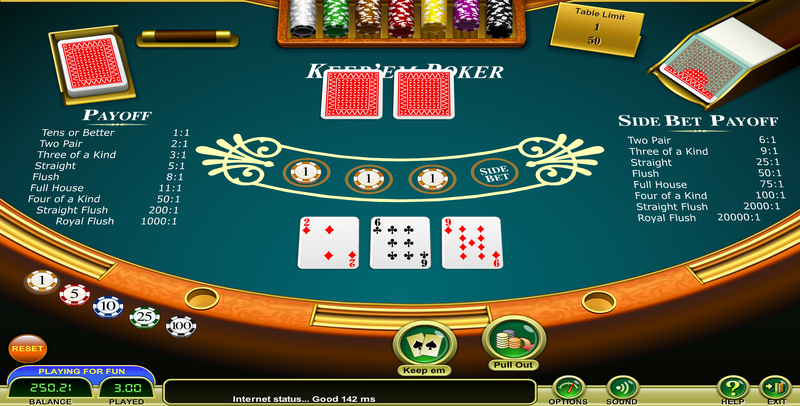 The player has a host of bets to choose from on the outcome, much like roulette. 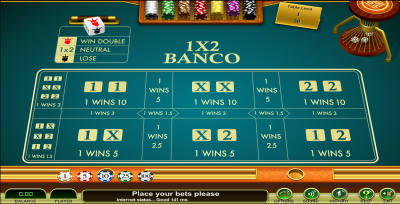 For a complete explanation of the rules and my analysis, please see my page on 1X2 Banco. 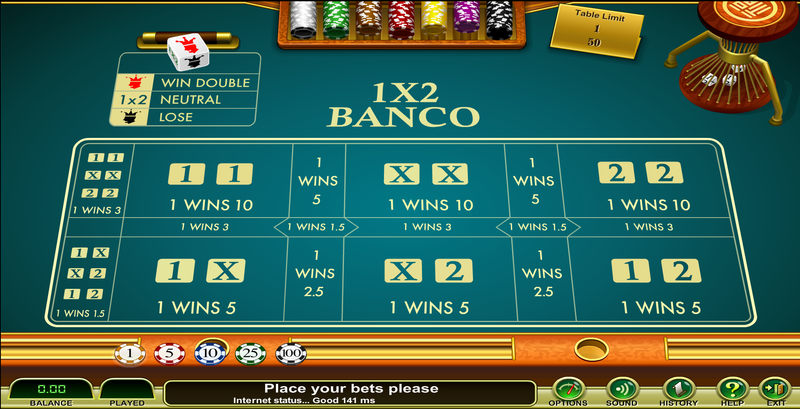 This is a no-nonsense game of baccarat. The help file doesn't state the number of decks, but it doesn't make much difference. The day I knew would come at last has come at last. Internet casinos are now dealing 6 to 5 blackjack. 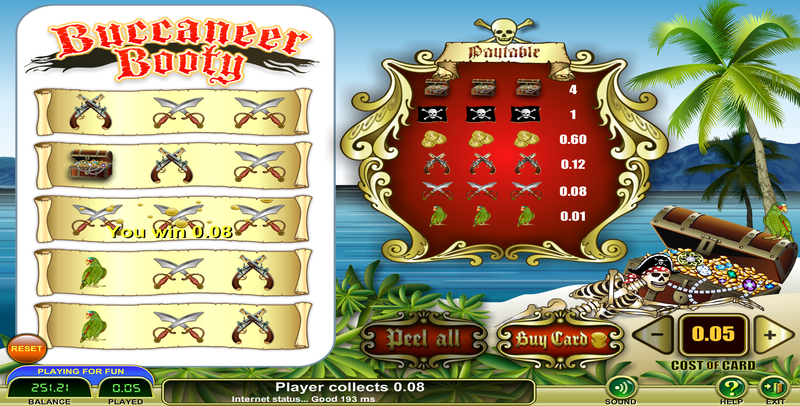 Indeed, Amigotechs is the first brand of Internet casino software I've seen to offer this awful game. The good news is there are some decent games too. The best game is basically a tie between the 3-2 single-deck game and the 6-deck game — both with surrender. Both have a house edge about 0.39%. There is no benefit to choosing the version without surrender. 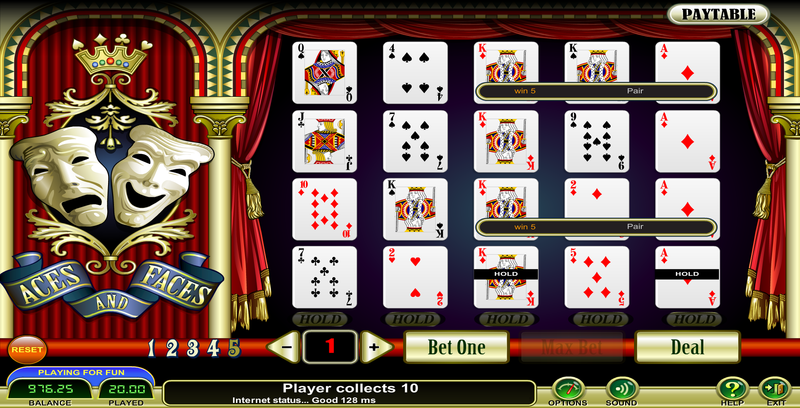 Many games have two versions -- one with a single player hand and one with up to three. Player may double any two cards. 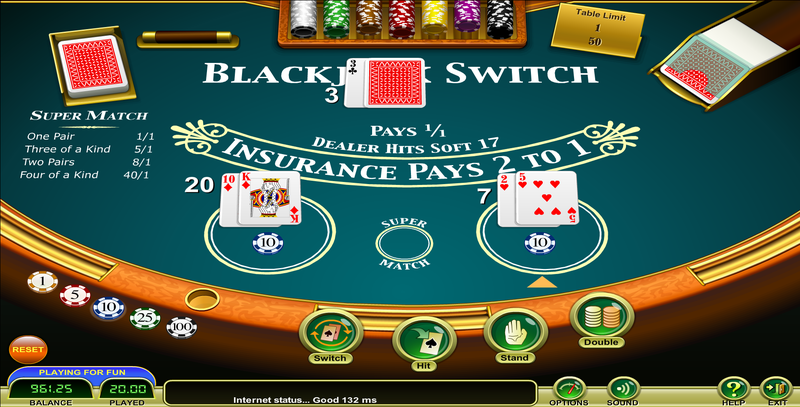 Blackjack and switched blackjack automatically wins. Normally, Amigotechs rules are rather stingy, but Blackjack Switch is a welcome exception. 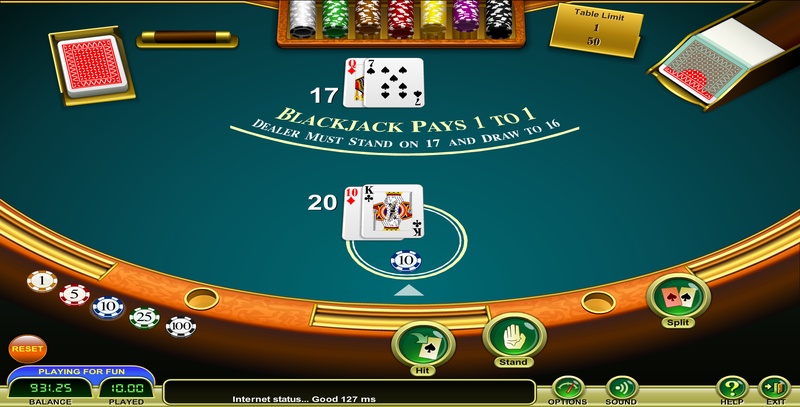 I suspect they didn't know that usually a switched blackjack is subject to the push 22 rule, if not all blackjacks. Given that all blackjacks, including switched ones, automatically win, I put the house edge at 0.18%. 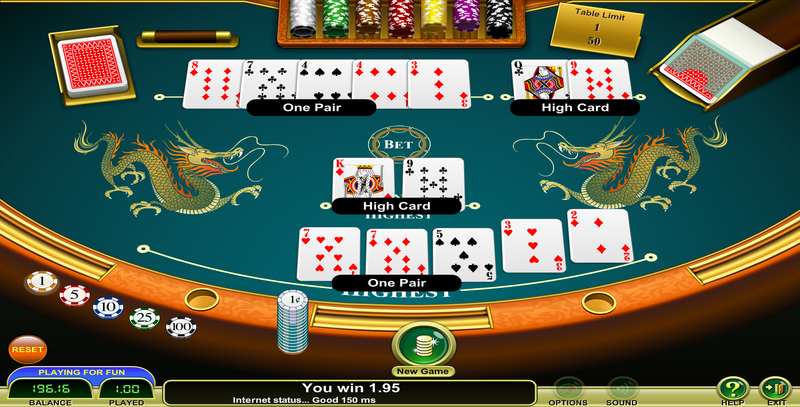 A single deck is used with the stingy "no bonus" rule for a tie after a tie. The house edge under these rules is 2.42%. For more information, please see my page on Casino War. Pass/Come odds: 3-4-5x. 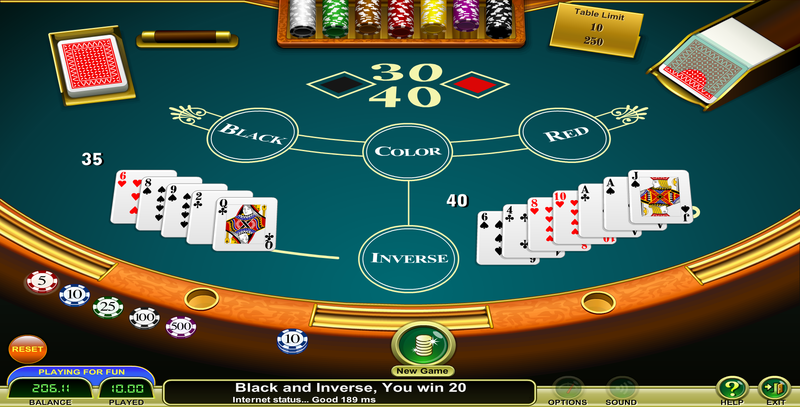 This means the player may bet up to 3x his pass or come bet on the odds if the point is a 4 or 10, 4x if it is a 5 or 9, and 5x if it is a 6 or 8. Don't Pass/Don't Come odds: 3-4-5x. 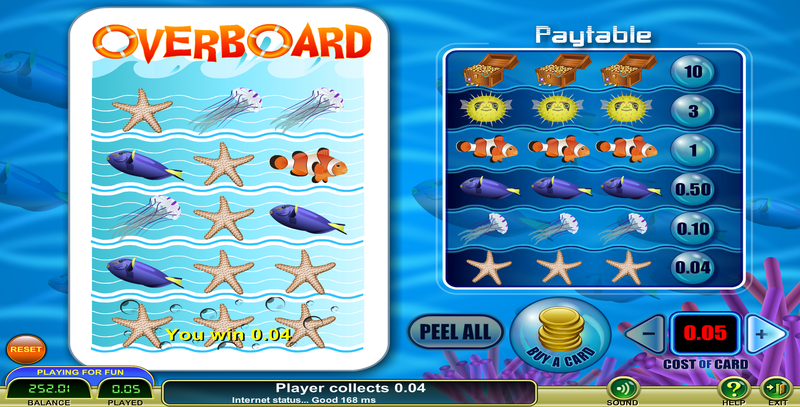 This means that the player may lay up to 6x his don't pass or don't come bet on the odds, relative to the bet amount. 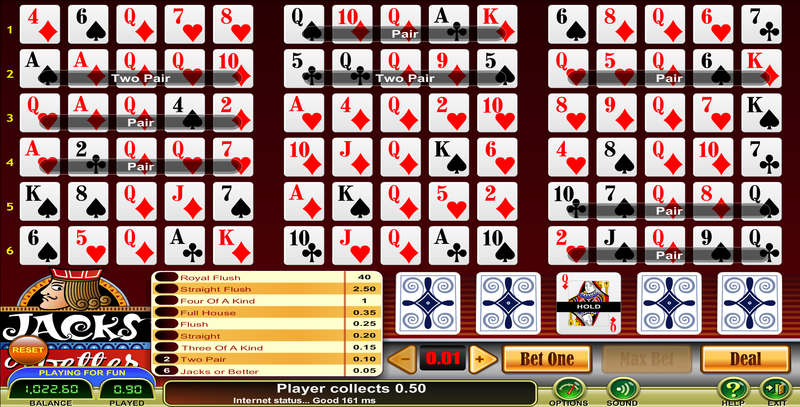 This equates to winning 3x on a point of 4 or 10, 4x on a 5 or 9, and 5x on a 6 or 8. 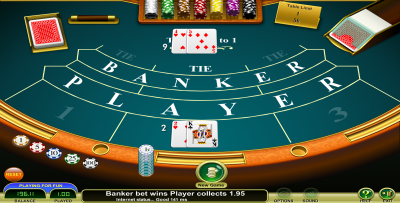 Place: Contrary to what the help file says, the only way to bet on the numbers directly is with place bets. They pay the standard odds of 9 to 5 on the 4 and 10, 7 to 5 on the 5 and 9, and 7 to 6 on the 6 and 8. Lay: Also contrary to the help file, as well as the table felt, the only way to bet against a number is with lay bets. These pay true odds, less a 5% commission based on the win and deducted after the win. This equates to odds of 19 to 40 on the 4 and 10, 19 to 30 on the 5 and 9, and 19 to 24 on the 6 and 8. Field: This is the stingy version that pays 2 to 1 only on a 2 and 12. Hop bets: Stingy rules that pay 15 to 1 on easy hops and 30 to 1 on hard hops. Hard ways: Stingy American rules that pay 7 and 9 to 1, depending on the number. Big 6 and 8: I've said this before but I find these bets very objectionable. Most casinos have the class to not offer them at all, but alas, this is not the case with Amigotechs. For those who don't know, these are the same thing as place bets on the 6 and 8, but instead of paying 7 to 6, they pay even money only. This is truly taking advantage of suckers who don't know any better. Any seven: The worst bet on the table. The stingy American 4 to 1 odds are offered, for a house edge of 16.67%. 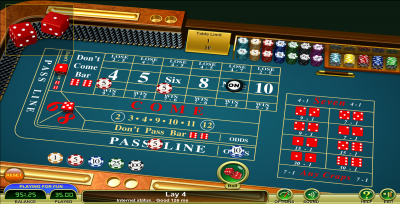 Any craps: Again, the stingy American odds are offered, in this case 7 to 1. In case you're wondering where you can bet better than the "American" odds, all the proposition bets and hard ways pay more in the UK and Australia. Also, many Internet casinos have liberal odds on these bets, with the lower overhead. However, such is not the case with Amigotechs. 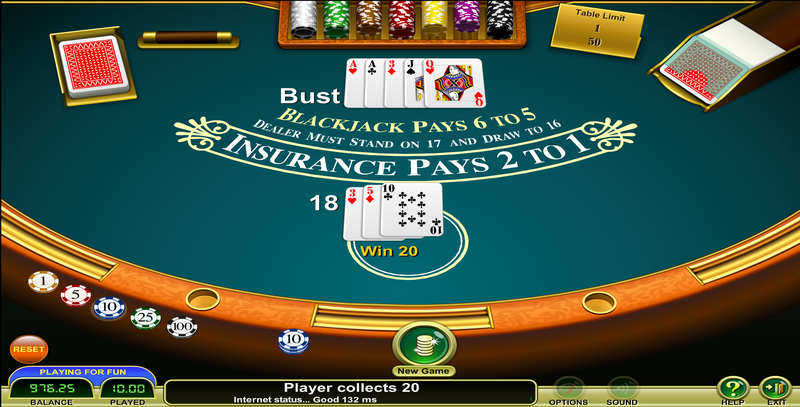 Tied blackjack is a push. The house edge I get under these rules is 0.99%. 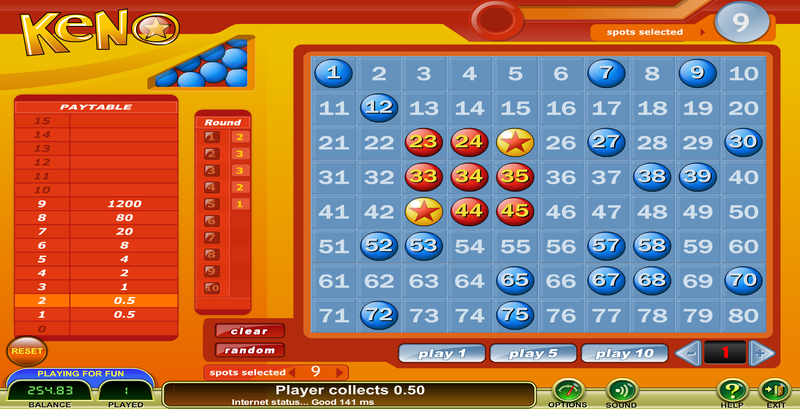 There are three keno games to choose from. The pay tables are as follows. The first pay table is for generic "keno." The second pay table is for "Keno Artist." The third pay table is for "Keno Dragon." 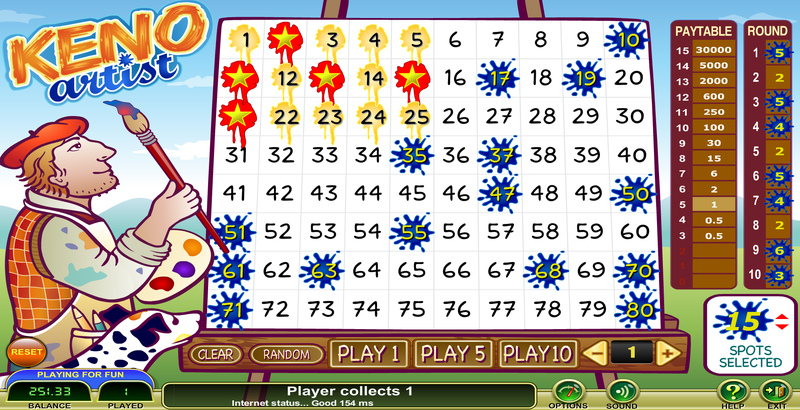 After crunching all the numbers, the following table shows the returns for all three keno game by the number of picks. The bottom line is the greatest return for regular keno is the pick-8 at 94.90%. 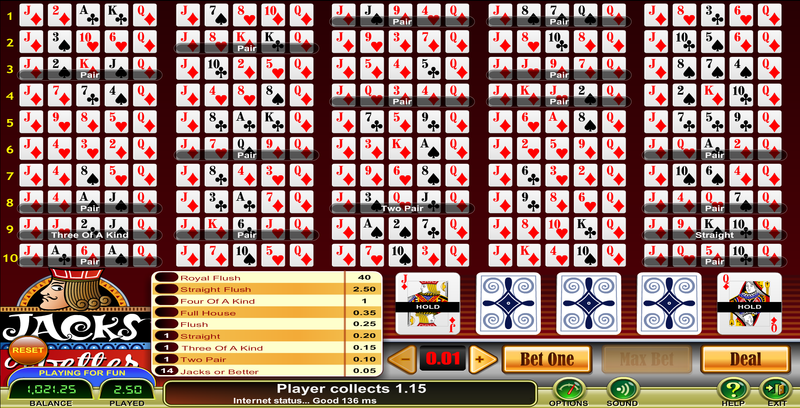 For Keno Artist it is pick-12 at 94.07%. For Keno Dragon it is the pick-1 at 97.50%. I know that keno players love the chance of a big windfall, which you obviously won't get with a pick-1. 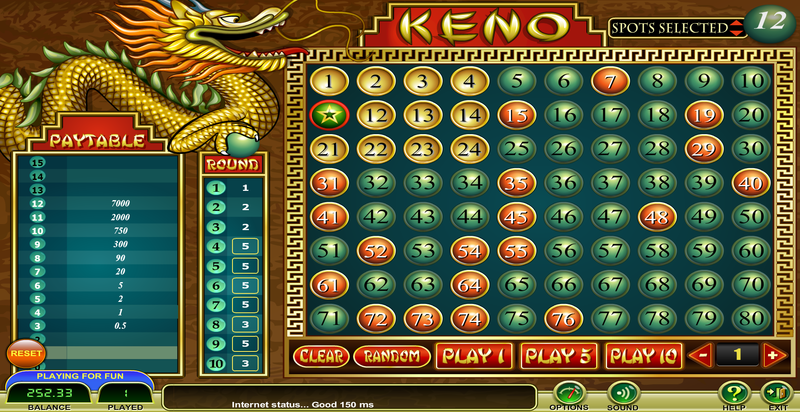 Regardless of what your risk tolerance is, Keno Dragon has by far the most generous pay tables of the three. Amigotechs calls their Let it Ride game Keep 'Em Poker. The standard 1-2-3-5-8-11-50-200-1000 pay table is used, for a house edge of 3.51%. There is also a side bet that goes 6-9-25-50-75-100-2000-20,000 (on a "for one" basis) for a house edge of 6.14%. 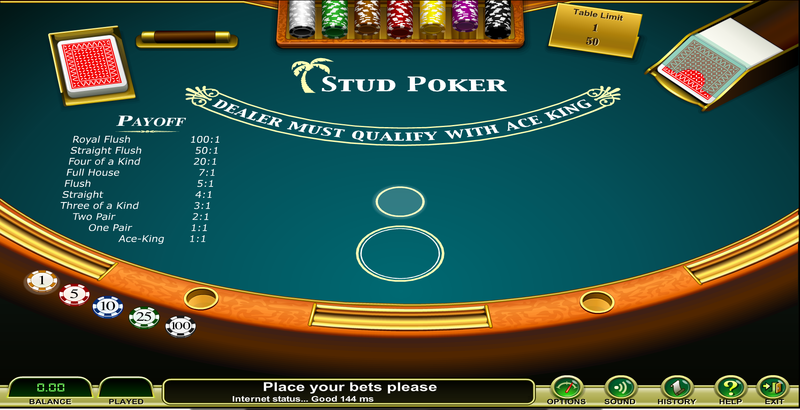 Amigotechs calls this game "Stud Poker." The standard pay table is followed for a house edge of 5.22%. 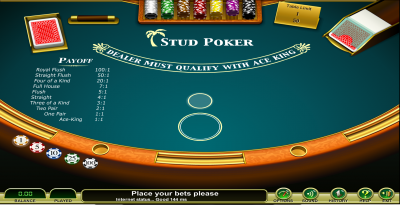 For more information about the game in general, please see my page on Caribbean Stud Poker. 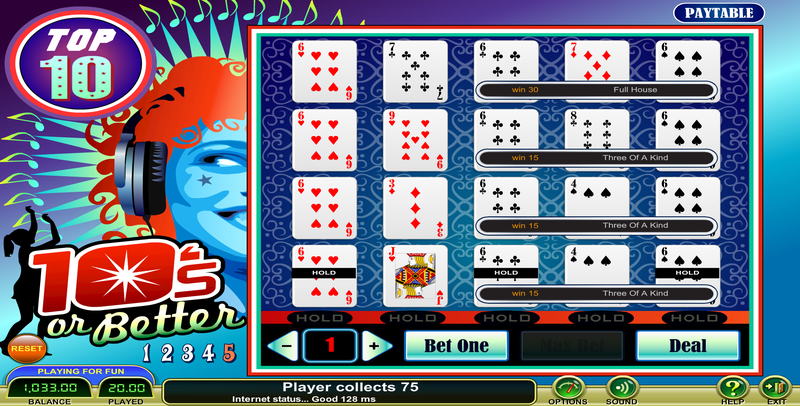 As far as I know, Amigotechs is the only brand of software to offer Crazy 4 Poker, which they call "Crazy Poker." 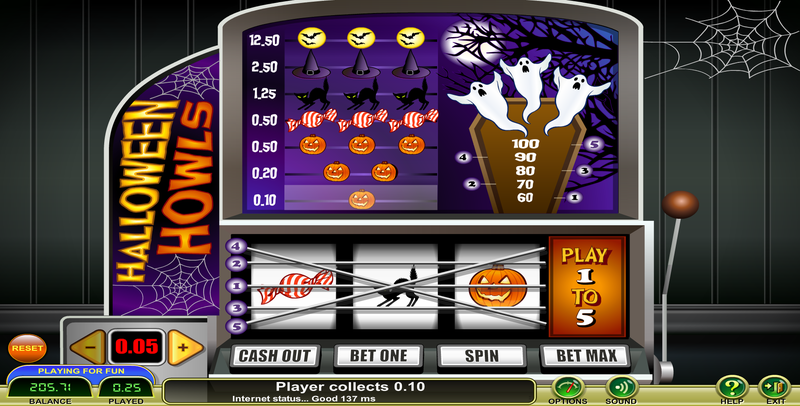 The usual 1-1.5-2-15-30-200 Super Bonus pay table is followed for a house edge of 3.42%. 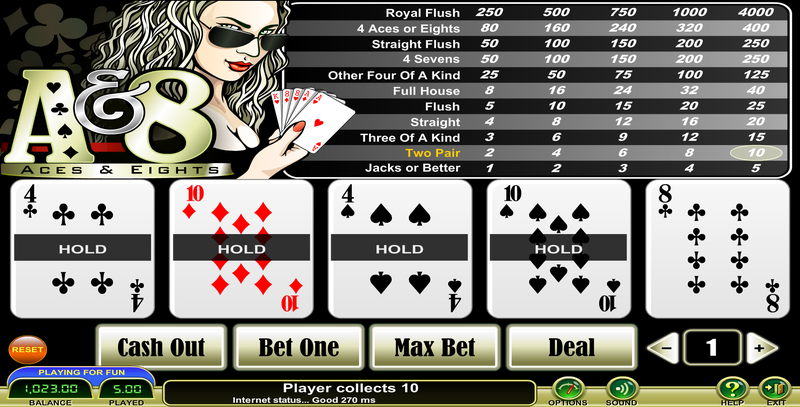 The Queens Up side bet follows the 1-2-3-4-8-30-50 pay table, for a house edge of 4.52%. I can't stand it when players call pai gow poker just "pai gow," but it is unforgivable for a casino to do it. 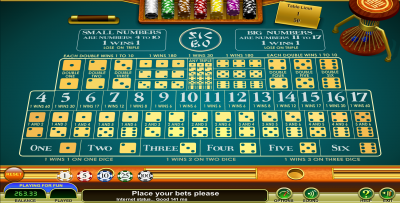 Pai gow is played with 32 dominoes or tiles. 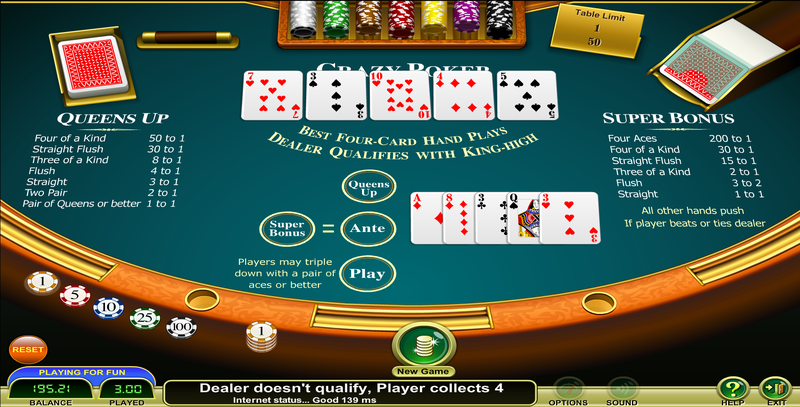 Pai gow poker is played with a deck of 53 cards. 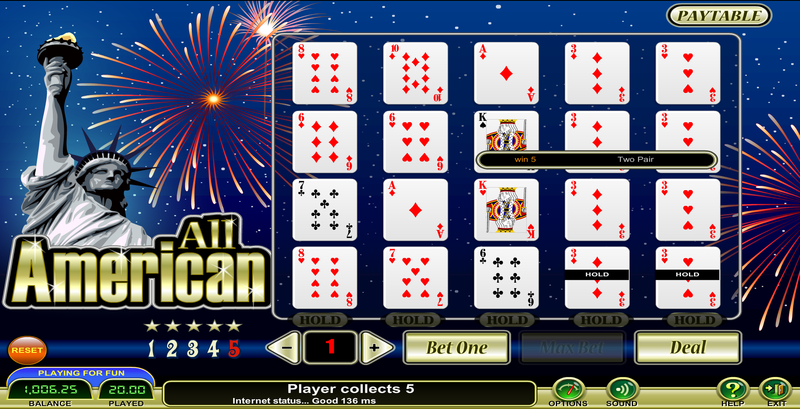 Amigotechs makes the amateurish mistake of calling their pai gow poker game simply "pai gow." 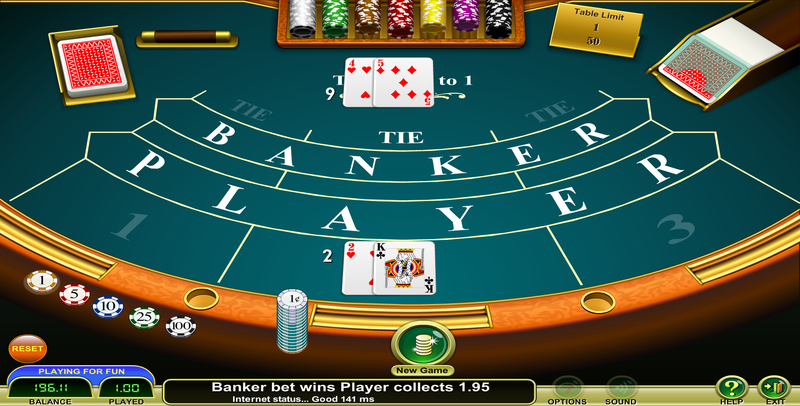 The dealer is always the banker, which results in a house edge of 2.72%, assuming the player follows the house way. Amigotechs calls their Three Card Poker game "Poker Three." They follow the usual 1-4-5 Ante Bonus pay table for a house edge of 3.37%. On the Pairplus they follow the liberal 1-4-6-30-40 pay table for a house edge of 2.32%. 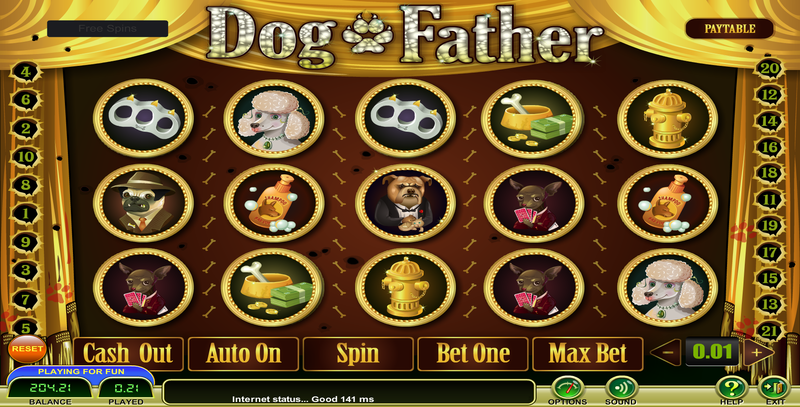 I find it funny how Red Dog died 30 years ago in the land casinos but just about every brand of Internet casino software offers it. Do Internet players just like Red Dog or is everybody else just following the crowd like lemmings? I don't know. Anyway, Amigotechs uses one deck and what otherwise looks like the usual rules. House edge of 3.16%. 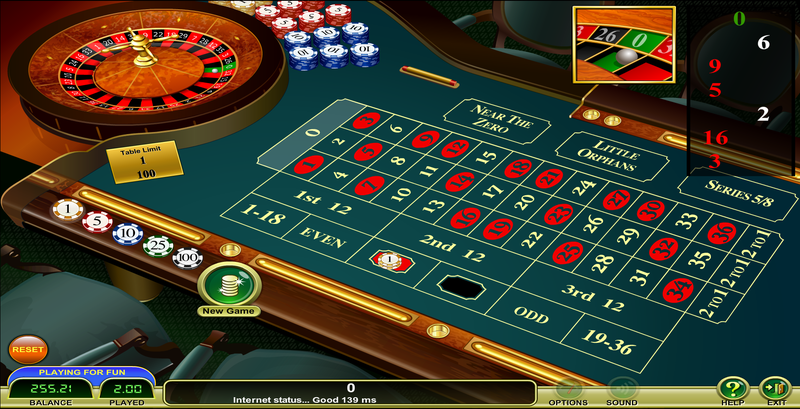 There are three roulette games titled American, European, and French. Following are some comments on each of them. This is double-zero roulette. Even money bets lose all when the ball lands in either zero. 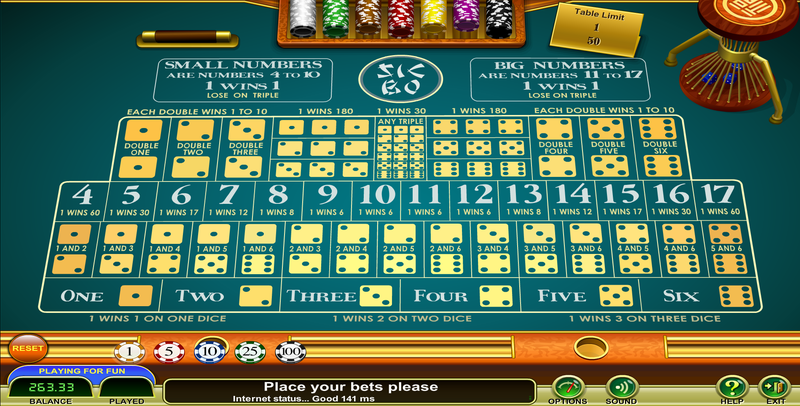 I noticed that the help file said the "five number" bet paid 8 to 1! Such a bet would have an expected value of (5/38)×8 + (33/38)×-1 = 7/38 = 18.42%. In other words, a player advantage of 18.42%! So I sat and played, making this bet every time until it won. When it finally hit I was paid only 6 to 1. That results in a house advantage of 7.89%. By comparison, the house edge is 5.26% on every other bet. This is typical of the incorrect and incomplete Amigotech help files. Single zero wheel. If the ball lands in zero the players loses all on even money bets. The house edge is 2.78% on every bet. Normally "French roulette" implies a single-zero wheel is used and the player loses only half on even money bets when the ball lands in zero. When I clicked on "help" to see the rules I got an error message. So I made a bet on red over and over until the ball landed in zero. When it finally happened I lost everything. So this game is mathematically the same as European roulette. 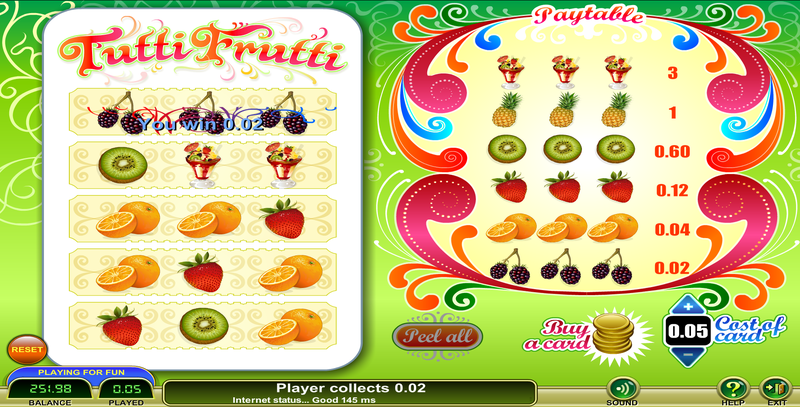 Amigotechs has four scratch card games. In all of them one bets buys four strips. No information is given on the return so you're on your own with them. The sic bo odds are very stingy. Perhaps the worst I've seen anywhere. 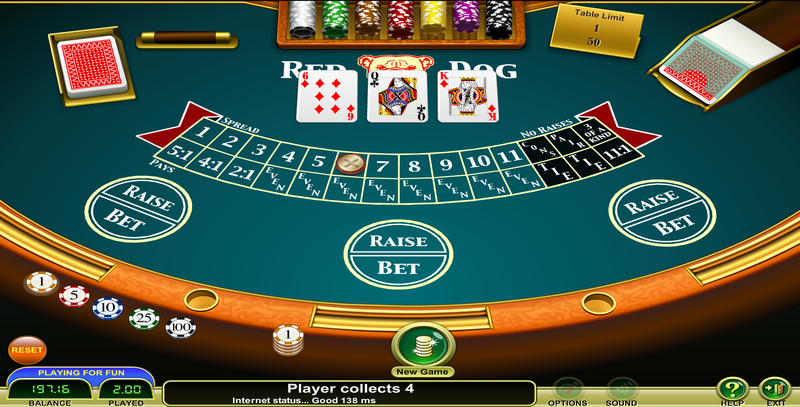 The following table shows what each bet pays, the probability of winning, and expected return. 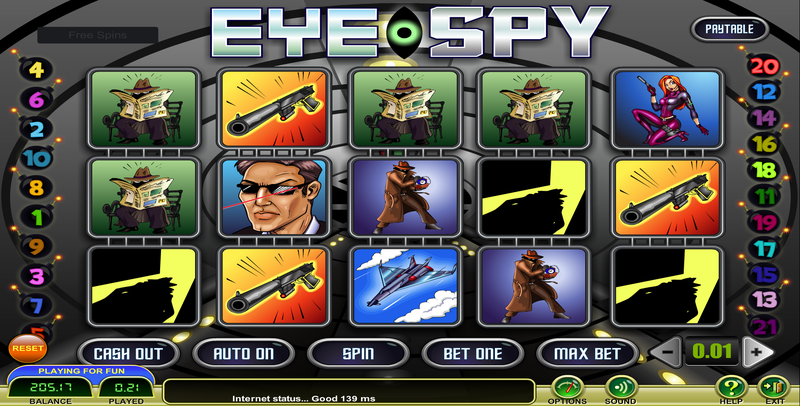 By my count, Amigotechs has 43 slot machines, as evidenced by the inventory at the Skybook casino. They all seemed to be traditional three-reel and five-reel games. I can't say that I was very impressed from an artistic perspective. The help files don't indicate anything about the odds, so you're on your own. I must say I'm surprised and impressed to see somebody offering Trente et Quarante at an Internet casino, despite them changing the name to 30-40. The house edge is 0.90%, assuming the player makes a maximum insurance wager. 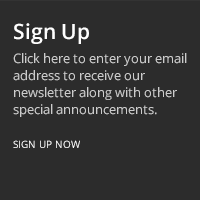 For more information, please see my page on Trente et Quarante. Be very careful which video poker game you play. 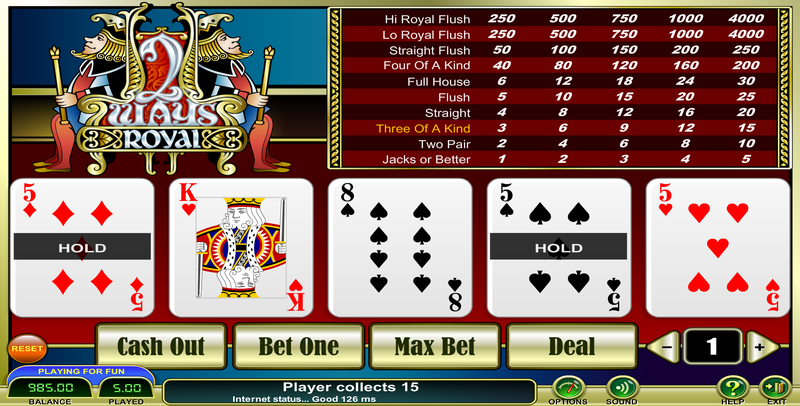 The house edge ranges from 0.20% (2 Ways Royal) to 13.19% (Joker Poker). This is an absurd spread, in my humble opinion. I also find the slow game play annoying and being bothered with a double up decision after every win. 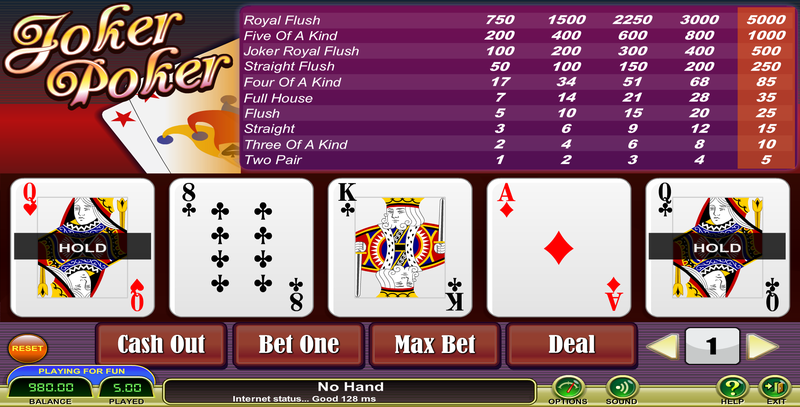 Finally, I'm getting tired of everybody copying Playtech's 2 Ways Royal game. 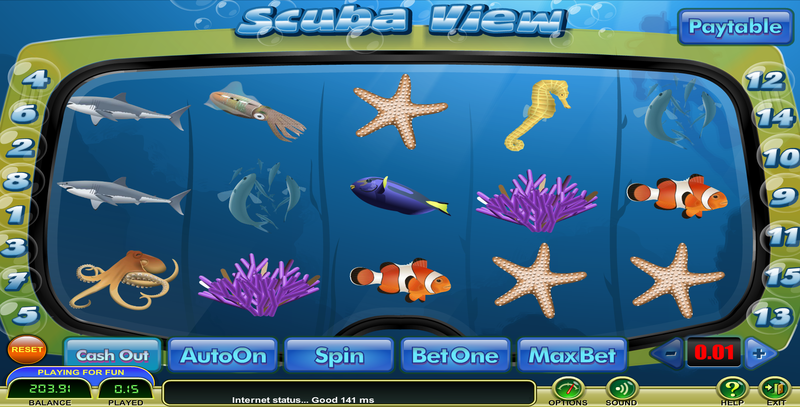 In the end, I simply cannot recommend Amigotechs as being an online gaming software that you should use. 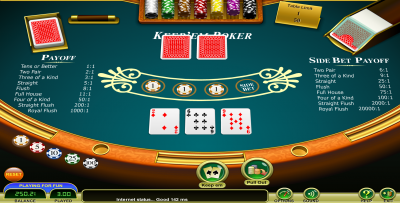 The company’s past history has seen it dealing out unfair hands of video poker, the games they now offer look outdated, and there are tons of inconsistencies in the rules of various games. 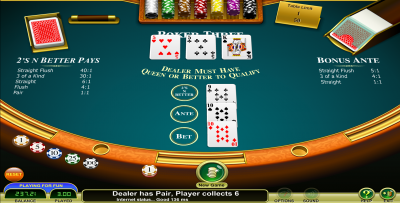 For these reasons, I recommend you avoid playing at casinos that offer Amigotechs software. 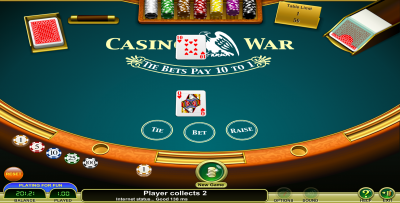 There are certainly much better gaming software firms out there, and you should definitely stick to casinos offering fair and secure titles.